In the era of the technological revolution, printings are still in craze that you can find everywhere, from the small business cards to the big packaging; however, the method of quality & productivity of the printings have improved dramatically through the empowerment of the modernized printing technology and automation system and therefore the quality of thereof decides the affluence of the printing industries, wherein the role of conveyor belt is equally accountable and therefore selecting the supreme quality conveyor belt for printing industries is wise move. At this point, our PVC conveyor belt for printing industries can be the trump card for your printing operations, developed with a considerable focus on the withstand capability against the heat, chemicals, dyes, oils, ozone and substance that are commonly subjected to the conveyor belt while respective matter is conveyed in order to deliver truly worthy solution for your conveying needs. The quality controlled manufacturing followed by the rigorous tests ensures the far reaching potency of our conveyor belt for outperforming for any printing needs and surpasses the life expectancy. The simple design and light weight are the extra benefits that you can find by investing in our conveyor belt for printing industries, derived from the stretched experience and qualification in the conveyor belt sector. No matter, you need to operate the conveyor belt for hours or for the light duty operations, we have all the potency to deliver you the custom made conveyor belt that meets all your needs at the best possible prices. 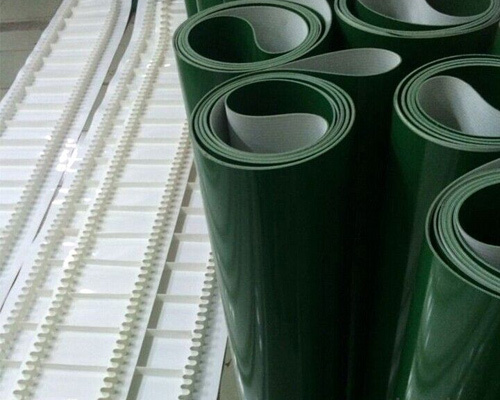 Besides that, the standardized range of the PVC conveyor belt is also available in the wide assortment of the specifications, both types are as per the standard quality regulation and hence promise for the utmost safety and reliability.